Welcome! The theme of our post is about the indie videogame we are developing, Holfraine: Black Eyes Troopers. We'll be noticing about development and progress, by now we share with you the concept, characters and gameplay. 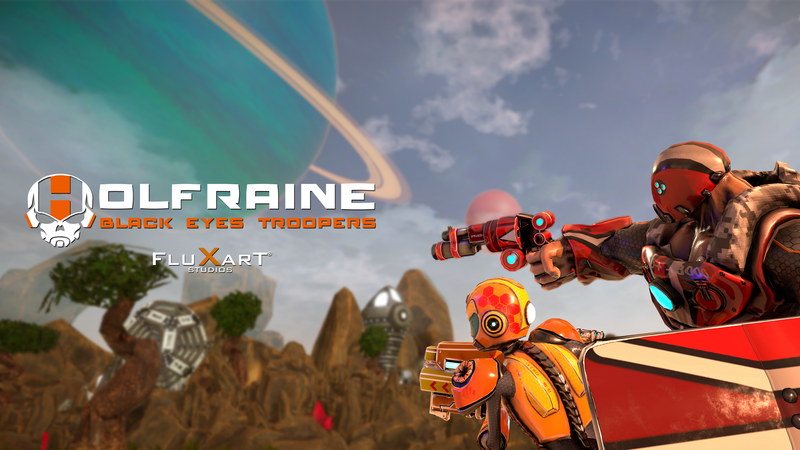 We are FluXarT Studios the developers of Holfraine: Black Eyes Trooprers, a spanish studio settled in Murcia formed by a team of young but experienced developers that looks for a place in the industry with quality products. Holfraine: Black Eyes Troopers it's a competitive and cooperative action multiplayer videogame of Hero Shooter genre in a third person view with a wide roster of heroes to choose. The objective of the videogame is to defeat the opposing team through matches full of dynamic elements in a way that we generate an innovating game mode that mixes features from other existing ones: Zone control, team deathmatch, flag capture and defend the payload are the game modes that happen through the lenght of a match, generating different challenges in every game. Earth, year 2085. Resources have been exhausted and the governments have implanted energy collecting bases through different planets and lesser moons from all the galaxy. The Black Eyes Troopers are a group of mercenaries that will fight to obtain the resources necessary for humanity subsistence. Holfraine is the most coveted mineral to restore earth's energetic reserves, and for that reason becomes this titles' banner due to all context being generated around it. It's time to be part of the Black Eyes Troopers. Each hero has his own weapon and skills, which are unique and can be combined to create a variety of combos thanks to how the combat system is made. Holfraine: Black Eyes Troopers is a competitive and cooperative online 5 vs 5 videogame where each hero is completely different, unique and capable of compenetrate with each other at 100%, creating a wide variety of strategies that both teams can use to achieve victory in each game. We look for balance between every character so we can give a more quick, dynamic and fair playability. The main goal is to win the most number of events that will occur through the match's progress, so we will have to know how to act and work together to achieve victory in each different challenge. Teamwork is crucial to reach victory.